Logic Hop integrates with Gravity Forms to provide personalization using form data. You can easily create conditions and display Gravity Forms data to create an engaging, personalized experience. Note: Gravity Forms functionality requires the Logic Hop Gravity Forms Add-on. 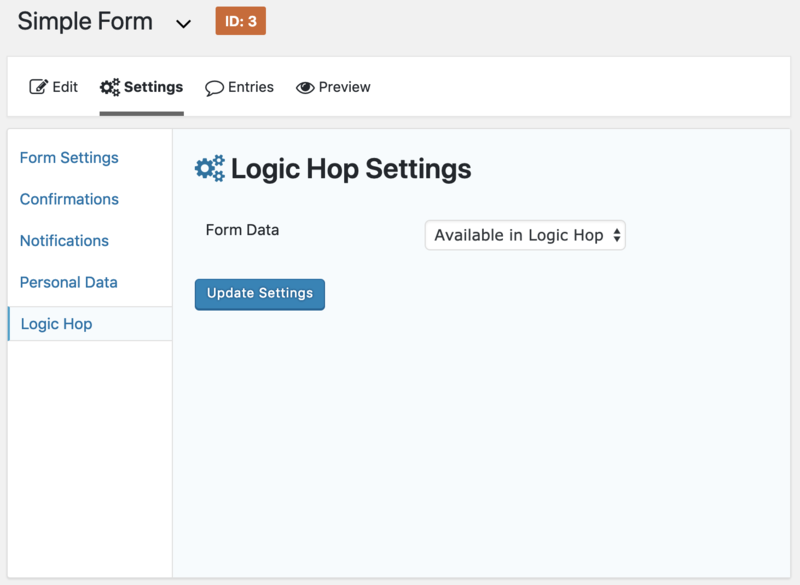 To make a form available for use in Logic Hop the Form Data setting must be set to Available in Logic Hop in the Logic Hop Settings menu of the form. The Form Data setting must be set for each form you’d like to enable for use in Logic Hop. The default setting for all forms is Disabled for Logic Hop. When a form is submitted more than once Logic Hop will store the most recent Entry ID. Field data is pulled from the most recent form entry. When a visitor returns to the site their form entry data is automatically loaded from Gravity Forms and made available to Logic Hop. GDPR Settings can override this and prevent data from being accessed. 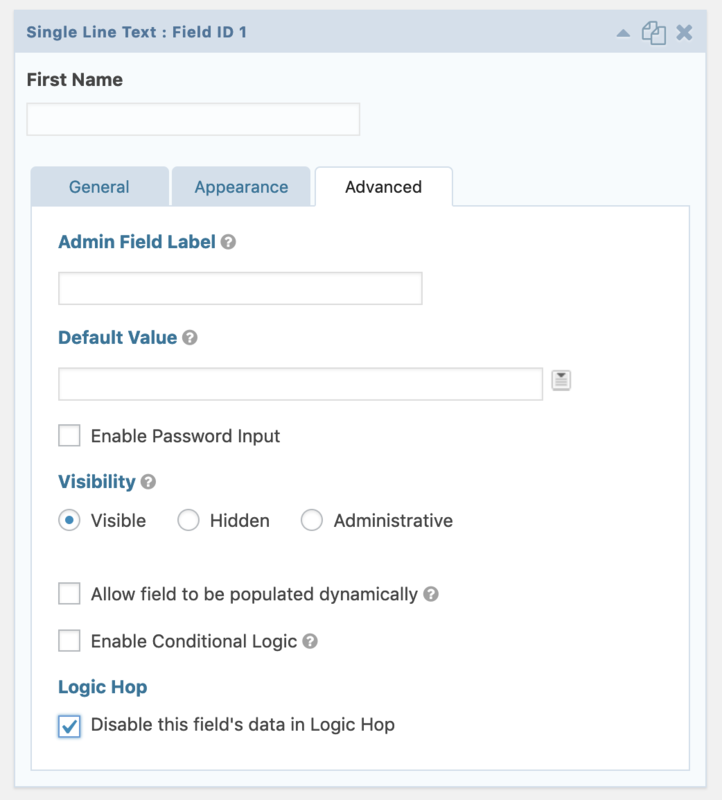 Logic Hop uses the Field Label to lookup and access field data by default. When an Admin Field Label is set it is used in place of the Field Label. Spaces in labels are automatically replaced with underscore characters. Labels are case-sensitive. Note: If two or more forms are enabled for Logic Hop and both have a field with identical Field Label names the data from the most recently submitted form will be used for that value. Fields can be disabled from use in Logic Hop. This field-by-field setting allows full control over which data is made available within Logic Hop. The current field setting determines if field data is available when the visitor accesses the site. The setting can be enabled or disabled at any time. Important Note: Logic Hop uses sessions or transients to temporarily store data for each user. This data is stored on your web server and never stored by Logic Hop. Forms that have a large number of fields or contain fields with large text values could cause memory and performance issues. It is always best to disable unnecessary fields and only use the minimum fields necessary for your needs. Replace ##Field Label or Field Admin Label## with the corresponding Gravity Forms Field Label or Field Admin Label. Spaces in label names are automatically replaced with an underscore. View the full list of Gravity Forms variables. Gravity Forms data can be used as parameters in Logic Hop Conditions. The Logic Hop Condition Builder will display all Gravity Forms condition types available for use. Each can be used alone or combined with other condition types to create complex logic.